1819 (circa) Born in Scotland (1). 1839 (circa) Enlisted in the Corps of Royal Sappers and Miners (2). 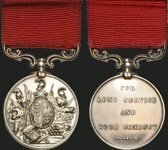 1841 Cape of Good Hope, 10th Company – TENTATIVE ONLY [WO11-93]. 1850 12 Dec, married Mary Ann MARTIN St Mary Magdalene Parish Church, Woolwich (3). 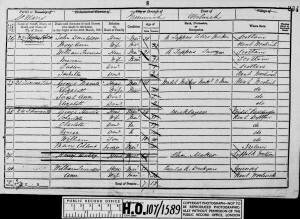 1851 Daughter Maria Emma’s birth registered in Medway, Kent (tentative) (4). 1851 Resided at 22 Thomas Street, St Mary’s Parish, Greenwich, Kent (1). 1851 Participated in the Great Exhibition at Crystal Palace where he won a bronze medal and present (5). 1851 2 Nov, left Portland on Marion. 1852 30 Jan, arrived Fremantle on Marion with 20th Company RSM. 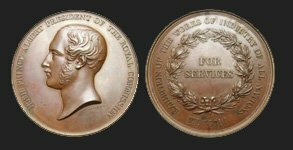 Rank: 2nd Corporal earning £1/10¾d. per diem. Trade: ‘collarmaker’ (6). 1852 28 Mar, employed as a Master Cook in the Convict Establishment at £30 per annum with rations for wife and one child (Maria Emma?) (7). 1852 May (only), employed as Instructing Warder at Mt Eliza Convict Hiring Depot (7). 1852 28 May, employed at Melville Waters (7). 1852 December to March 1853 January employed at Mt. Eliza Convict Hiring Depot (7). 1853 18 Jun, resigned due to ill health of wife (7). 1853 20 Jun, employed at Saw Pits, Fremantle (7). 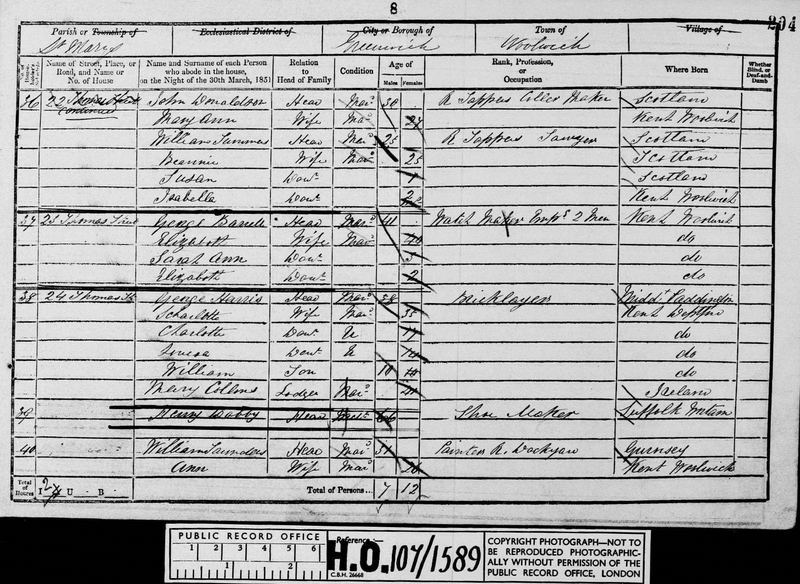 1853 Daughter Mary Ann’s birth registered in Fremantle(8). 1853 Daughter Mary Ann’s burial 30 Nov in Fremantle (9). 1854 Son John’s birth registered in Fremantle (8). 1856 18 Jul, died intestate with effects in excess of £50 (10). 1856 Widow (Mary Ann) applied for Letters of Administration (11). 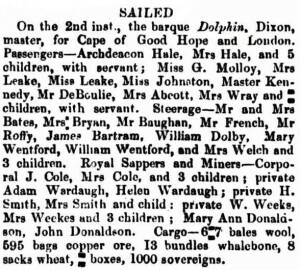 1857 2 Mar, Mary Ann Donaldson and son John sailed from Fremantle on Dolphin for the Cape of Good Hope and London (12). 1. 1851 Census of England & Wales [HO107-1589], National Archives, Kew. 3. GRO Marriage Index England & Wales [Q4 1850 Greenwich Vol. 5, p. 387]. 4. GRO Birth Index England & Wales [Q1 1851 Medway Vol. 5, p. 457]. 5. History of the Royal Sappers and Miners, T W J Connolly, Volume II. 6. Musters and Pay Lists Oct 1851 – Jan 1852 [WO11-130]. and Musters and Pay Lists 1852 to 1855 [WO11-126, 134, 138, 142, 146]. 8. Index to Registry of Births, Deaths and Marriages in WA. 9. Family Search, Church of Latter Day Saints. 10. Musters and Pay Lists Jul 1856 [WO11-152]. 11. Applications for Letters of Administration [Cons 3458-1856-78], State Record Office, Perth, WA. 12. 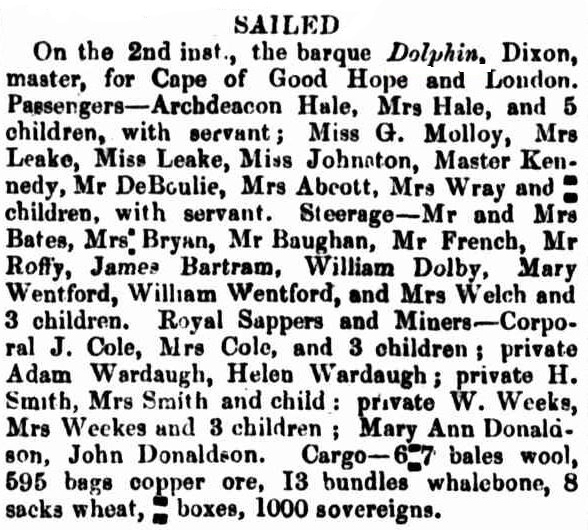 Perth Gazette 6 Mar 1857 [TROVE]. 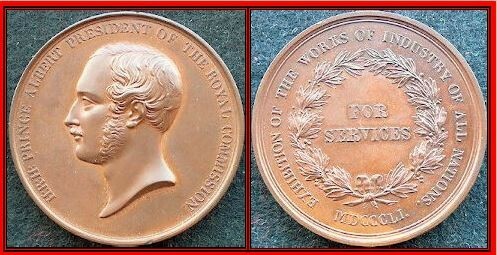 Prince Albert Bronze Medal for Services at the Great Exhibition. John Donaldson won a 5th class prize – a case of instruments – value 10 shillings.